• RS232 to Isolated 1-Wire adapter. • 1000 feet, 100 devices per CAT-5 twisted pair 1-Wire bus. • Automatically provides smart strong-pull-up for wired sensors. • ESD Protection more than 27kV (IEC801-2 Reference Model.). • Built-in DB9 for cable connection to PC. • 9 VDC AC Adapter included. • Provides isolated power to the network. • Short-circuited network recovery function. • TMEX compatible using DS9097E driver. 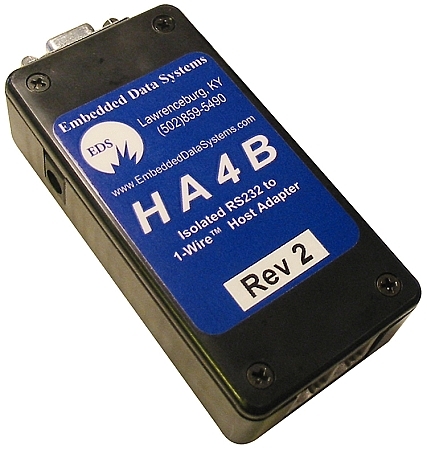 The HA4B is a RS232 to isolated 1-Wire adapter. Designed to mate with the DB9 RS232 port of a PC, this powered converter provides the necessary level conversion from RS232 to 1-Wire device levels while providing 2000VAC isolation from the PC to the 1-Wire network. When CAT-5 twisted pair cable is used, the HA4B can drive up to 100 1-Wire devices at cable lengths of up to 1000 feet. The HA4B is recommended for applications where isolation from the network is required; analog applications or isolated digital applications. The HA4B typically withstands 1600VRMS for 1 minute or 2000VRMS for 1 second. External power is applied via a standard power jack. Boost current for DS18B20 or DS18S20 temperature conversion is provided by RTS switching so that parasitic temperature conversion is supported. The HA4B also has an improved short-circuited network recovery function that provides fast recovery from a shorted (energy depleted) network. The circuitry in the network driver stage of the HA4B automatically senses a shorted network and provides a high current boost to the network until all the devices on the network have recovered to a viable operation voltage.